The 9 Best Places for Pancakes in Iowa! If breakfast is the most important meal of the day, then pancakes must be the real MVP in the food world. Nothing beats the sizzle of pancake batter on the griddle or the satisfying feeling of a flapjack in the morning. If you’re looking for this breakfast fix in Iowa, you won’t have to travel very far to find some excellent pancake possibilities. From diners to cafes, here are the best places for pancakes in Iowa. For one of the best bites to eat in the Iowa City area, Bluebird Diner has been serving a delicious breakfast, lunch and dinner spread since 2002. Alongside uniquely inspired omelets and other traditional breakfast fare, Bluebird has a house recipe for pancakes that will always have you coming back for more. Topped with creamy whipped butter, syrup and fresh whipped cream upon request, the real treat comes with the additional strawberries, griddled bananas or blueberries you can add onto your stack. Every university town has their quintessential breakfast diner, and for Iowa State University in Ames, the Grove Cafe tends to attract a lot of students and community members alike. With a long list of potentially new favorite breakfast items, ordering a single pancake at this laid-back cafe is always a good way to go. Roughly the size of a breakfast plate or larger, the Grove Cafe guarantees their extra-large pancake is one of the best you’ll ever have. For one of the best breakfasts in the DSM, Mullets invites not only your biggest appetites, but it tends to draw a pretty fun crowd throughout the week. A perfect stop to fuel up or refuel on a long bike ride throughout Des Moines, among many of their breakfast items, Mullet’s pancakes fill you up right. 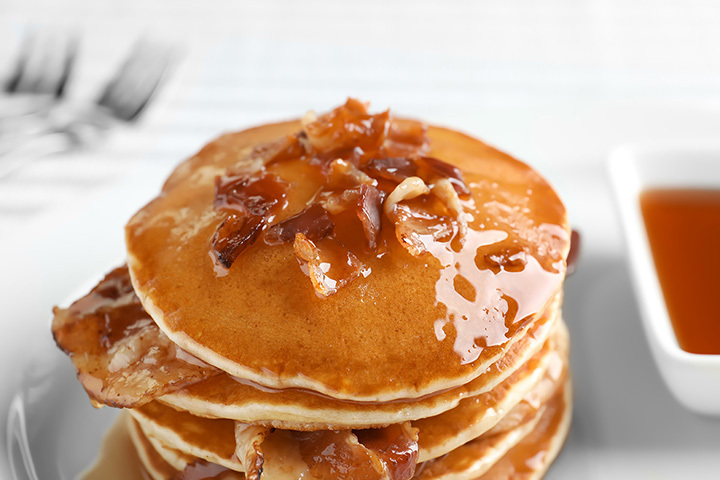 For your flapjack fixings, it’s recommended to order the Pancakes & Eggs off the menu, which also comes with a bacon, sausage or ham. The name says it all for some cafes, and it’s easy to know what to expect when visiting the Breakfast House in Cedar Rapids. While this locally owned establishment does specialize in light lunch and brunch options, it’s the pure breakfast entrees that most people seek when visiting this local favorite cafe. For pancakes on the menu, a traditional route is always the way to go, but so are specialty items like Pancake Wraps and Sunrise Cakes. Well known for some of the best hash browns in the universe, the Waveland Cafe is an iconic diner that serves up pancakes hot and fresh off the griddle. Plate sized or traditional are two of the pancake choices at Waveland, as well as Pigs in a Blanket and a Buttermilk Pancake Special. Top it off with a never-ending cup of coffee, and you’ll find yourself wanting to visit the Waveland for years to come. Newton’s Paradise Care of Waterloo serves up much of your traditional breakfast fare with their own unique twist. The homemade pancakes on the menu might resemble your regular pancake prescription, but with one bite into these fresh and hot griddle creations, and no other pancake will ever be the same. Head on over to the Paradise Cafe for the food and stay for the comfortable seating and friendly atmosphere. Your one stop shop for a great cup of coffee and even better meal, the PerKup Cafe has a wide assortment of breakfast fare to choose from. While the pancakes are worth writing home about, the best menu move you can make is combining the flapjacks with other a la carte items. PerKup Cafe makes this easy for you with their Jack’s Stack breakfast entree on the menu, including with it two pancakes, hash browns, two sausage links and two slices of bacon. Come on down to the Country Kitchen of Marion for a great breakfast and fun place to hang out. This small-town cafe is known for their big flavors, and with their designated menu section known as “Pancake Paradise”, they can help you quench the flapjack fever. Within the Pancake Paradise, some of the local favorites include banana nut pancakes, triple chocolate pancakes, and cinnamon apple swirl pancakes. Made to order with the freshest pancakes available, you better believe that Jimmy’s Pancake House packs your breakfast with flavor. Alongside other classic and traditional breakfast fares, Jimmy’s Pancake House is stacked with flapjack flavors. While the house-special full stack of buttermilk pancakes is always a good way to go, patrons who are feeling a little more adventurous can opt for flavors like white chocolate raspberry or tiramisu.